On diagrams a new mode allows to visualize elements that has been hidden manually. When this mode is activated, hidden elements (nodes, containers, edges) appear lighter on the diagram. They can be made visible again by just double-clicking on them. Coming with this evolution, a new dropdown menu gathering the layouting, visibility and standard mode has been added to the tabbar. The standard mode corresponds to a diagram editor without the layouting and visibility mode activated. This blog post describes this new feature. 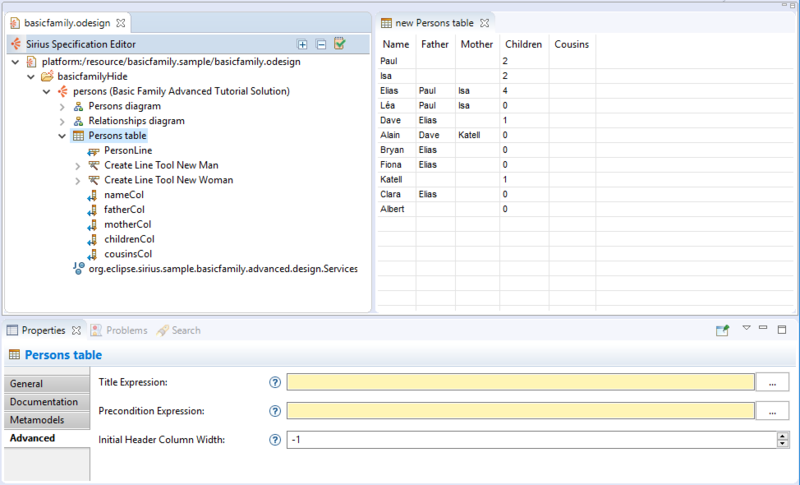 The creator of a Sirius-based modeling tool can better manage contextual popup menus by using groups. In addition to specific menus in the main popup menu, now it is also possible to group actions (displayed under a separator) and to create menus on several sub-levels. The first column of a table (default header column) can be hidden by default by specifying value -1 in the Initial Header Column Width field of Edition table representation. When opening a modeling project created with an older version of Sirius, the project was automatically and transparently migrated to the current version. Now, since Sirius 6.1, a preference has been added to ask the user if he wants to save session resources after an automatic migration. Sirius licence has been upgrade to Eclipse Public License 2.0. A comprehensive list of Sirius 6.1 changes can be found in the Official Release Notes. Read What's new in Sirius 6.0 to see the new and noteworthy features of previous version.